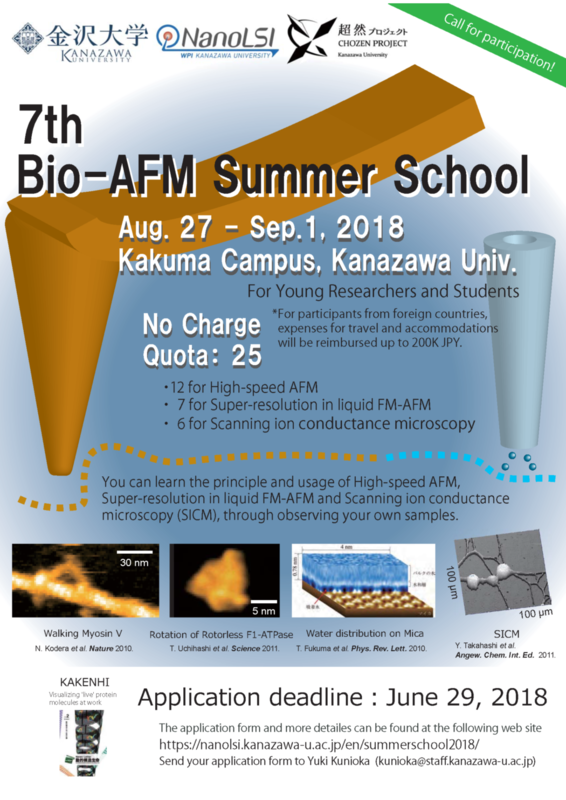 The Nano Life Science Institute (WPI-NanoLSI), Kanazawa University, is calling for participants for Bio-AFM Summer School. The research teams of Kanazawa University have engaged in the pioneering development of original Bio-AFM technologies, including high-speed AFM, super-resolution AFM (FM-AFM/3D-AFM), and scanning ion conductance microscope (SICM), and applied them to the life sciences. 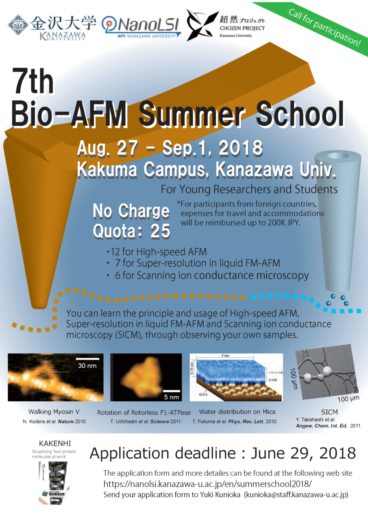 The Nano Life Science Institute (WPI-NanoLSI), Kanazawa University, will hold a “Bio-AFM summer school” and is calling on young researchers and students who are interested in Bio-AFM systems. In this school, we provide participants with the opportunity to use our Bio-AFM systems for imaging of their own samples and realize their potentials. Participants can choose among systems ranging from high-speed AFM, super-resolution AFM, and SICM, according to their purpose. Biological samples or materials related to biological research are available for imaging with Bio-AFMs. The NanoLSI faculty teaches not only the usage of the instruments but also the preparation of samples. Young researchers and students who are interested in observing their own samples by Bio-AFMs. Prior knowledge about Bio-AFM is not required. The targets of super-resolution AFM include any solid-liquid interfacial structures and phenomena whose understanding require subnanometer-scale imaging. Examples include organic and inorganic crystals, self-assembled monolayers, surfactants, lubricants, proteins, DNAs and lipids. The high-speed AFM can observe living cells and isolated intracellular organelles in addition to proteins and DNAs. SICM can observe surface structures of larger samples such as living cells or bacteria. You can learn some one super-resolution FM-AFM, high-speed AFM or SICM (not both). We remind you that you may not be able to find appropriate imaging conditions of your samples within the period of this summer school. Those who participated in the previous Bio-AFM summer school are no longer eligible to participate. Please apply our Bio-SPMs collaborative research.